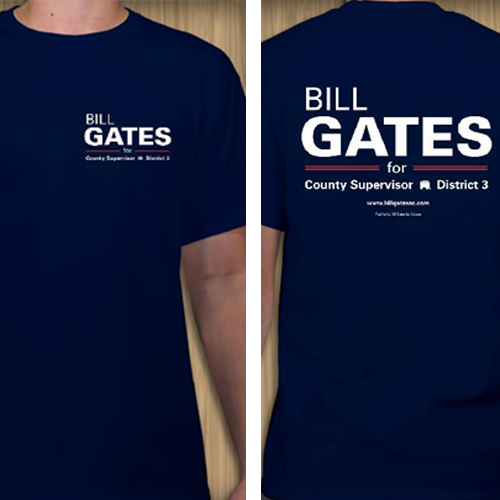 Want your own Bill Gates for County Supervisor t-shirt? You can get this limited edition Bill Gates t-shirt for a $25 donation to his campaign. Quantities are limited so order yours today. Contributions to Gates for Arizona are not deducible for tax purposes. An individual may contribute up to $6,250 per election cycle. (Married couples may contribute up to $12,500 total.) Contributions from corporations, labor unions, and foreign nationals (non-green-card holders) are prohibited. (No business or corporate credit cards or checks.) Arizona law requires Bill Gates for Arizona’s best efforts to obtain, maintain, and report the name, address, occupation, and employer of any individual who contributes more than $50 in an election cycle.